A mouse looked through the crack in the wall to see the farmer and his wife open a package. “What food might this contain?” The mouse wondered - he was devastated to discover it was a mousetrap. Retreating to the farmyard, the mouse proclaimed the warning. 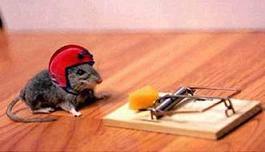 So, the mouse returned to the house, head down and dejected, to face the farmer’s mousetrap alone. That very night a sound was heard throughout the house — like the sound of a mousetrap catching its prey. The farmer’s wife rushed to see what was caught. In the darkness, she did not see it was a venomous snake whose tail the trap had caught. The snake bit the farmer’s wife. The farmer rushed her to the hospital, and she returned home with a fever. Everyone knows you treat a fever with fresh chicken soup, so the farmer took his hatchet to the farmyard for the soup’s main ingredient. But his wife’s sickness continued, so friends and neighbors came to sit with her around the clock. To feed them, the farmer butchered the goat. The farmer’s wife did not get well; she died. So many people came for her funeral; the farmer had the cow slaughtered to provide enough meat for all of them. The mouse looked upon it all from his crack in the wall with great sadness. So, the next time you hear someone is facing a problem and think it doesn’t concern you, remember — when one of us is threatened, we are all at risk. You see, everyone seems to be going on about free speech, but that’s not the only issue here. There is also the issue about respect, courtesy, circumspection and discernment. Perhaps those editors ought to have been given a course in cross-cultural understanding and communication. They were supposed to be trying to show who were the enlightened ones. It is really silly of them to deliberately taunt and provoke those who just do not understand the West’s worship of liberty rights. Those who are championing the editors and cartoonists for their free speech rights have missed the point. Those who blame every Islam itself for the extremism of a few have fallen into the trap of gross generalization. The problem with making generalized judgments over media reports, photos and newsreels is that these visions may portray a generalization that does not represent the view of the majority. Especially if you do not know anyone who is Muslim, and have never lived among Muslims. Maybe you think they are all like that. And, those who think this is their problem, (whether they refer to the Muslims or the Europeans) need to rethink and see that we are all in this together. Whatever is going on, it is not going to be good for any one of us. May we learn the lesson from the story of the mouse.